Manchester United twice came from behind against Arsenal in an entertaining 2-2 Premier League draw at Old Trafford on Wednesday. 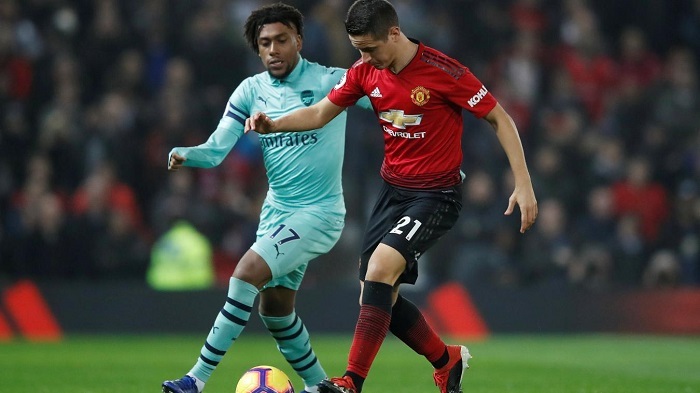 Arsenal grew into the game after some early United dominance, and went ahead 26 minutes in when De Gea let Mustafi’s header slip through his grasp and Ander Herrera could not clear off the line in time. United hit back just four minutes later, though. Bernd Leno saved Rojo’s free kick, the ball was turned back towards the six-yard box by Herrera, and Martial swept it high into the net. The match descended into a scrappier contest, with Arsenal losing Rob Holding and Aaron Ramsey to injury, as both sides seemed to struggle with the torrential rain and slick surface. And the pitch did United no favours at 68 minutes in with a horrible moment for Rojo. Having given the ball away to Lacazette, who exchanged passes with Henrikh Mkhitaryan, the defender raced back, only to divert the ball past De Gea with a sliding challenge on Arsenal’s number nine. However, the Gunners once more failed to protect their lead, Lingard pouncing on some uncertainty in the visitors’ box to slide the ball beneath Leno, 74 seconds after United had fallen behind. With the game suddenly coming to life, Arsenal wasted two chances to take the lead for the third time, Pierre-Emerick Aubameyang shooting straight at De Gea from point-blank range before Mkhitaryan missed with a near-post touch. Aubameyang was denied again by a sprawling De Gea, Jose Mourinho threw on Paul Pogba, but neither side could find a winner, with United’s goalkeeper making a fine late stop to prevent Lucas Torreira from snatching victory. Tottenham’s victory over Southampton means Arsenal are now in fifth place, although they are only behind Chelsea on goal difference. Their unbeaten run stands at 20 matches in all competitions. Mourinho certainly saw some of the spirit and ‘simplicity’ he was looking for from his players, and given their injury problems, he will not be too disappointed to take a point. However, that eight-point gap to the Champions League spots is unlikely to shrink quickly unless United can beat the teams they are competing against for those coveted places. United went into the game with serious injury problems in defence, but Eric Bailly, who has struggled for form and fitness this season, starred in the makeshift defence with an accomplished display against Aubameyang. Rojo’s passing from the left was useful and he hit a good free kick that led to United’s first goal, but his error for Arsenal’s second was dreadful and he was perhaps lucky to be booked only for a challenge on Matteo Guendouzi. United host Fulham on Saturday before they conclude the Champions League group stage in Valencia next week. Arsenal are at home to Huddersfield Town in three days’ time, after which Qarabag visit Emirates Stadium next Thursday.